114 pages | 36 B/W Illus. 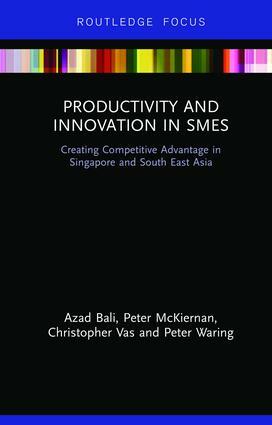 This book analyses the determining factors behind productivity and innovation amongst Small and Medium Enterprises (SMEs) in Singapore, and within the context of South East Asia, in order to offer recommendations for increasing productivity and aiding economic growth. SME firms are an influential driver of economic growth in advanced world economies like the USA, Germany, Japan and South Korea. Throughout the 2000s, Singapore experienced a decline in economic growth which was linked to decreasing productivity in its SMEs. The decline triggered a transformational policy by a Government intent on forging a ‘high skill–high productivity’ future. Given substantial evidence that low productivity growth occurred in sectors where immigrants dominated the workforce, the seeds of recovery focused on improving productivity and innovation amongst SMEs in those sectors. Hence, this book investigates the factors determining productivity amongst SMEs across the manufacturing sector. It utilises personal interviews with global experts and CEOs, combined with primary data collected from a major international Delphi survey, and interviews with 215 SME owners and managers in Singapore. This data helps us to better understand how these productivity-enhancing factors can be used to increase performance amongst SMEs. By investigating the nature and process of total factor productivity in Singapore’s SMEs, this book tells the policy story behind the revolution. To provide a comparative analysis, Singapore’s story is placed within a South East Asian context. The unfolding narrative contains important lessons for policy makers and industry globally, as they assess the strategic choices available to them for improving productivity and innovation. This book will be of great interest to students and scholars of innovation and productivity, as well as economic development officers, government policy advisors, SME business managers and sustainable businesses. Azad Singh Bali is a Lecturer in Public Policy at the University of Melbourne. Peter McKiernan is Professor of Management at the University of Strathclyde, Scotland. Christopher Vas is Associate Professor at Murdoch University, Australia, and Deputy Dean and Director of the Singapore Centre for Research in Innovation, Productivity and Technology (SCRIPT). Peter Waring is Associate Professor at Murdoch University, Australia, and Dean of the Singapore campus.